Styled Locks & Building Blocks: Shave Balm...Face Primer?? So of course I was intrigued. Im obsessed with Primer. I want to be like the celebrities where the look flawless all the time due to their primer and contouring skills (meanwhile in real world they have stylists and makeup artists...but in my mind I pretend that I can look like a celebirty/supermodel if I try hard enough...ok maybe not but we all need goals!!). I have tried a few primers and my favourite at the moment is Stila One Step Corrector. I love this primer. Its like moisturiser colour corrector and primer in one and it looks all scientific with its triple helix modelled creme. Now that I am on a budget and will struggle to afford my fancy primer (ok its only $52 you might say, but to me its expensive and with all makeup it adds up, and I wear primer ALL the time). So I thought I'd try this shaver balm. $12 what have I got to lose?! Dignity and self pride by buying mens shaving balm. I purchased it as if I was purchasing tampons or condoms, I had to slip it in amongst other "normal, everyday" items i was purchasing and wouldn't be judged for. Shampoo, lipstick, tinted moisturiser, paw paw cream and amongst that would be Nivea Men's Post Shaving Balm. Ok maybe Im over thinking it but I care what people think. I shouldn't, but I do. I mean this whole blog makes me feel vulnerable and uncomfortable as it is but I want to try it, so I need to cop people's judgement and my friends making fun of me, and some of them even correcting my spelling errors. Back on topic Nivea Shaving Balm. Apparently it contains a high level of glycerin which acts like a glue for your makeup. Most primers don't have this ingredient according to those bloggers who few bloggers who have claimed how great this Shaving Balm is. The 'Stila One Step Corrector' does, however what the levels are in it I'm not sure. What is Glycerin you ask? I wasn't quite sure either and I felt I should have a look into this. Glycerin is a neutral, sweet-tasting colourless thick liquid which freezes to a gummy paste and has a high boiling point. Glycerin can be dissolved in to water or alcochol but not oil. In the shaver balm it is diluted into water to not severely dehydrate the skin as if it acted along with would significantly dry out your skin making it less of a balm/moisturiser and more like a glue. So I have been using it the last 2 days. First thing I thought it felt oily so I would suggest you don't use much more then an amount the size of no bigger then a 5 cent piece...it spreads quite nicely. 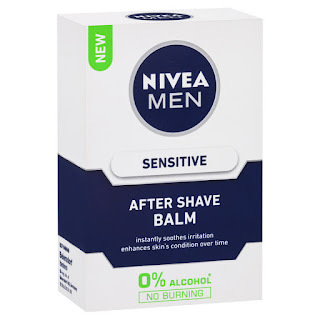 It also felt more like a night cream at first but its absorbs quite nicely and made my skin feel quite smooth, more then other moisterisers I have tried. I shouldn't really be a surprised as its designed to smooth and hydrate skin after a man has shaved his chin. The one thing I did find off-putting however was the smell. Not that it was a bad smell, it was nice actually but it made me smell like a man. So I started to wonder how long the smell would stay around for and was starting to envisage people looking at me weird when interacting with me.